...novel is a story of alternate realities and of a modern man transported between them. This is a such a common theme in Gygax's list of "inspirational and educational reading" that I can't help but wonder why no published D&D product, either during his time at TSR or subsequently, dealt with it, except very obliquely. Perhaps I'm just waxing philosophically this morning, but is not our very activity of gaming nothing more than the story of a modern man being transported to an alternate reality? A gaming supplement addressing such a scenario seems almost superfluous. Quite honestly it sounds better as a concept than it does in actual play. Every time we tried something like this my group reverted back to the standard mode of play. This was probably due to the fact there are already modern people playing. That most fantasy worlds are really Olde Tyme settings than historical recreations. That the character being played are generally modern in outlook. Nothing wrong with any of this mind you. But it all combines to make the Connecticut Yankee in King Arthur scenario a lot less compelling in a D&D game. Likewise, I'm also a little skeptical -- it seems like using "modern man in fantastic medieval world" would run into all the same problems that using LOTR for gaming does. Story too specific for gaming, if the one transported character perishes there's no obvious way to replace them, etc. But I'd entertaining hearing a pitch for what such a scenario would look like. But since D&D is set up to generate and adjudicate PCs from the medieval world, now that's our "home base", and it would be most direct to have adventures with the medieval characters flung into different worlds. And that we do basically have, with things like S3, the "Mace of Cuthbert" adventure, etc. I would guess that a modern-man-in-medieval-times story would need the modern man as an NPC propelling the action forward. Well, it would seem that at least Richard Garriot picked up on such implications. The Ultima series was influenced by Dungeons & Dragons and is largely about a modern man transported into a fantastic medieval world. I'm with Mike. Playing a Yankee in King Arthur's court seems like an unnecessary layer of complication compared to just playing a knight or playing yourself the way the original Blackmoor players did. but is not our very activity of gaming nothing more than the story of a modern man being transported to an alternate reality? This is a such a common theme in Gygax's list of "inspirational and educational reading" that I can't help but wonder why no published D&D product, either during his time at TSR or subsequently, dealt with it, except very obliquely. Quite a while back R.A. Salvatore put out a book called The Woods Out Back that dealt with this theme. It was a pretty good book, reading when it came out (I was 12 or 13 at the time). I was thinking along exactly the same lines as Amityville Mike. 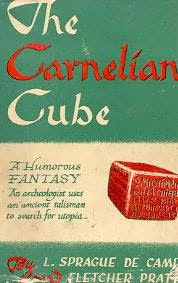 Does the book cover the carnelian cube's origins? Beyond the Apollonius connection, I don't recall any further explanation for the nature of the cube.